We love maple syrup. And often rely on advice from Katie Webster, who in her cookbook, Maple- 100 sweet and savory recipes featuring pure maple syrup, recommends that if a recipe calls for 1 cup of white sugar, use 3/4 cup of maple syrup while also decreasing other liquids called for in a recipe by about 3 tablespoons per cup of maple syrup used. Although limiting intake of calories especially from processed and industrial food is important in our age of widespread obesity, a quarter cup of maple syrup, unlike sugar, supplies 62 percent of your daily riboflavin requirement, about 9 percent of calcium, 8 percent of zinc, and 5 percent of potassium and less maple syrup than sugar is required to sweeten a recipe. We respect Michael Pollan’s advice that “sugar is sugar” and processed foods that have some form of sugar (or sweetener) listed among the top three ingredients should be avoided, but we also like Rowan Jacobsen’s appreciation of how only sugar maples have flowing sap with a miraculous formula of high sugar content, a few flavor compounds and nothing nasty. And according to Rowan Jacobsen, in a must-read chapter on maple syrup in his wonderful book American Terroir, the only suitable terroir in the world for maple syrup is the Greater Northeast, described as a triangle running from Michigan to New Brunwick (Canada) to West Virginia. Uniquely American maple syrup prompts a certain pride in this upstate New Yorker and also provides a way to spend food dollars locally. 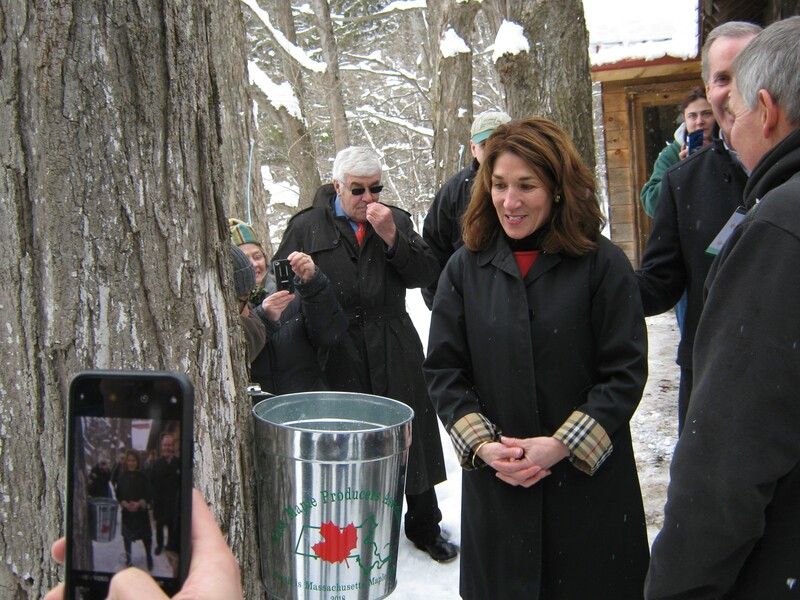 So when we received word that Massachusett’s Lieutenant Governor Karyn Polito was going to tap the ceremonial first tree of the 2018 sugaring season at Mill Brook Sugarhouse in Lenox (Berkshire County), Massachusetts, an easy drive from home in Albany to the beautiful Berkshires, a March snowfall the day before the tree tapping didn’t deter. 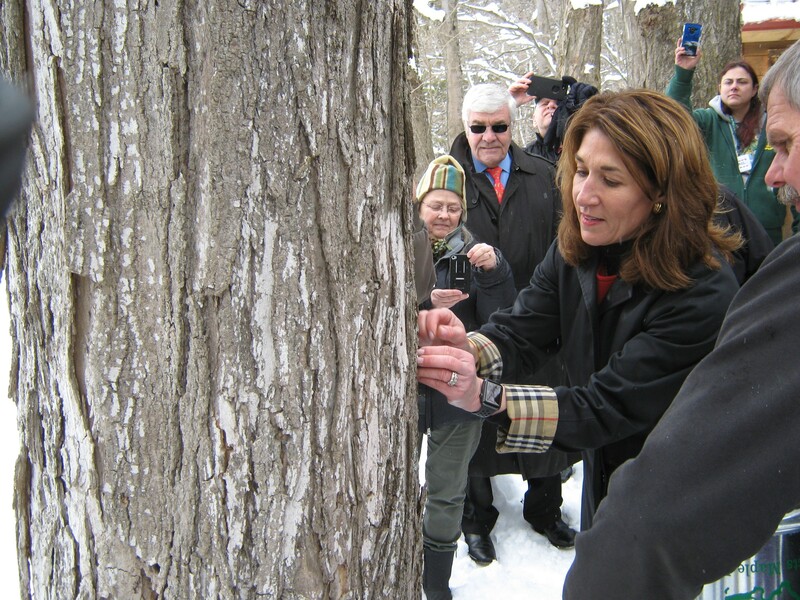 Maple syrup is the first crop of the year for Massachusetts and other states in the Greater Northeast, and Karyn Polito, accompanied by Massachusetts Secretary of Environmental Affairs Matthew Beaton and Commissioner John Lebeaux of the Department of Agricultural Resources, took pleasure in proclaiming March to be Maple Month in Massachusetts, and this coming weekend of March 17-18 has been designated Maple Weekend in the state. 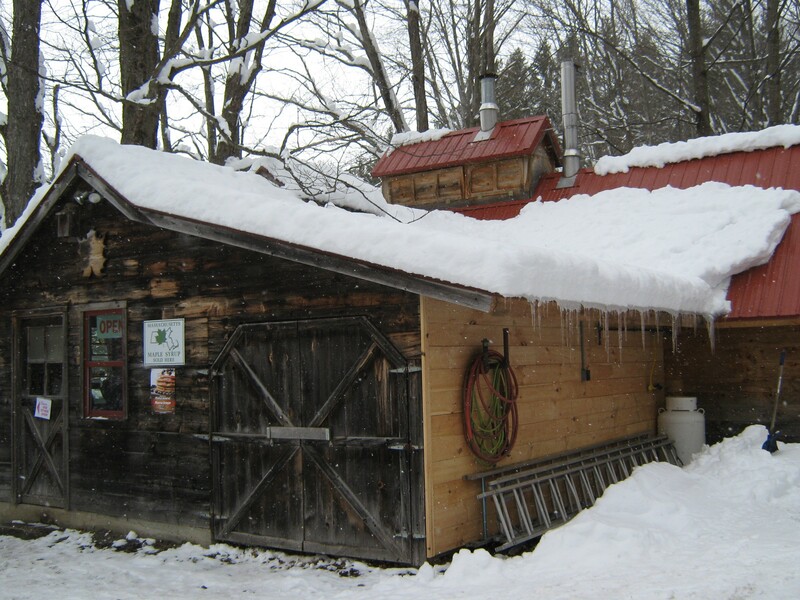 Sugarhouses around the state will be open to visitors who want to see syrup being made, learn about the process and history of maple production, and sample and purchase what is described as the state’s sweetest crop. Massachusetts has more than 300 sugar makers around the state and maple syrup production generates estimated economic activity of $6 million and employment for 1,000. 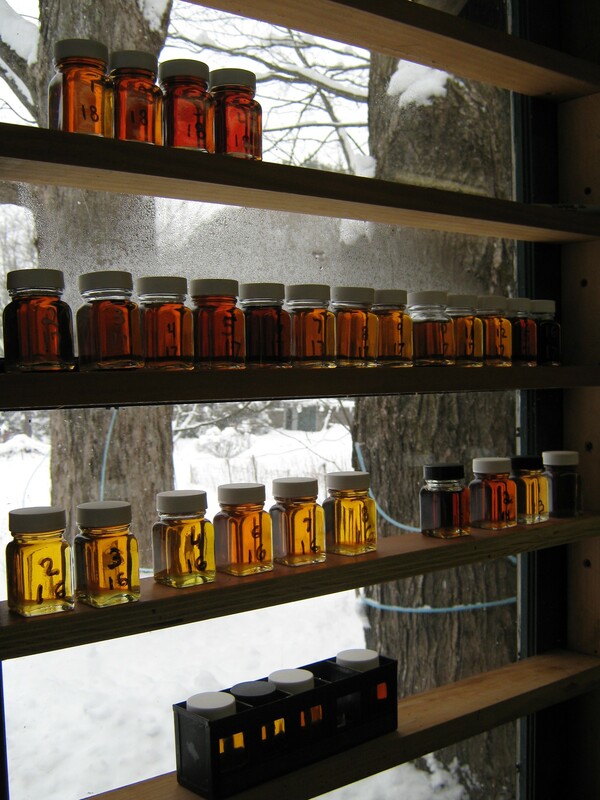 For information on other sources for maple syrup in the Greater Northeast, the website Sugarbush Info maintains listings of over 500 maple syrup producers (sugarbushes) in the United States and Canada. And Sugarbush Info also has listings for 27 maple syrup festivals in Canada and the United States. In addition, March Is Maple Month has also been declared in Indiana, Michigan, Minnesota, New Brunswick, New York, Ontario, Wisconsin, and New Hampshire. 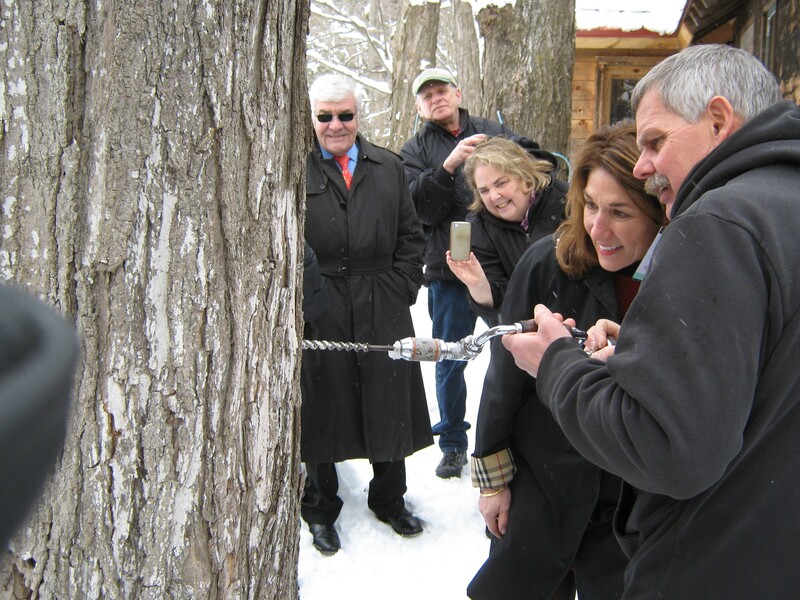 The Green Mountain State of Vermont (renown for its maple syrup) has a Maple Open House the weekend of March 24-25, and Maine is celebrating its 35th Anniversary Maple Sunday on March 25th. Ohio promoted its maple syrup with its Maple Madness Driving Trail, earlier this month.